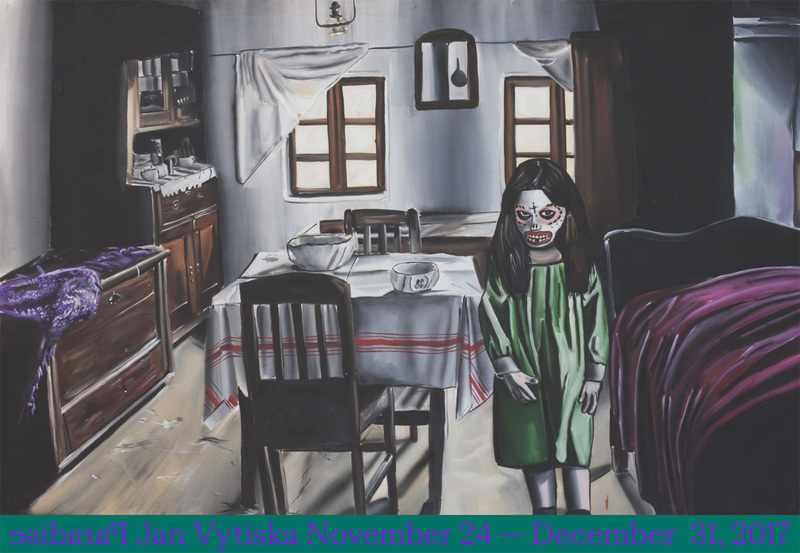 In his most recent paintings, Vytiska has returned to folk motifs directly inspired by the legends and tales recounted in “Čertoviny z Valašska” (Stories from Wallachia). However, this is not so much the reappearance of familiar themes, but a new understanding and an expansion of their meaning. Vytiska’s postmodern mix does not stand still, nor does it wander futilely down blind alleys. On the contrary, his creative language has transcended the borders of region and attracted attention abroad, especially as part of the travelling exhibition “Neue Schwarze Romantik” (2017), where his paintings feature alongside the works of well known figures such as Martin Eder, Anders Grønlien, the Brothers Quay, etc. Vytiska’s paintings are comprehensible within a broader international context. They bear witness to the hectic chaos of the contemporary and combine extravagant artistic gestures and the banality of pop culture, high and low, beauty and ugliness, death and life. Opening view and catalogue launch with concert of the band Johnny the Horse will take place on November 23, 2017 at 7pm. For the accompanying program we have prepared Devils celebration of St. Nicolaus with masks on Tuesday December 5 at 7pm and commentary visit with Jan Vytiska and curator Otto M. Urban on Tuesday December 12 at 5pm.